Tianjin (China), March 12th, 2005 – The new Handysize vessels « LA SILLONAIS », « LA SOLOGNAIS », « LA CHAMBORDAIS » and « LA SAUTERNAIS » have been named today in China by their Sponsor Ladies Mrs Corine Peugeot, Mrs Adeline Piedelièvre, Mrs Sabine Roux de Bézieux and Mrs Luce Gendry. These new ships have been ordered by LDAP, a joint-venture between LOUIS DREYFUS ARMATEURS Group (LDA), FFP and Bank Paris Bertrand Sturdza (PBS). 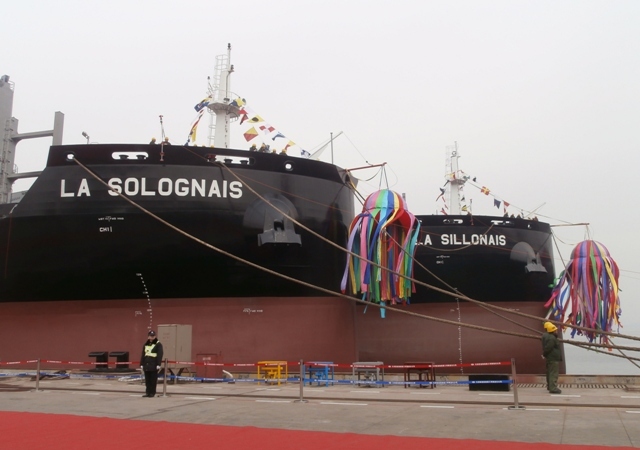 The naming ceremonies took place at the Chinese shipyard Tianjin Xingang Shipbuilding Heavy Industry Co. Ltd. where the four bulkcarriers were built such as six other ships that had been previously ordered by LOUIS DREYFUS ARMATEURS Group, named and delivered between 2013 and 2014 (two Capesize and four sistership Handysize B.Delta 37 vessels, ordered by LDAR, a joint-venture between LDA and ROULLIER Group). Many guests – among others His Excellency Ambassador Maurice Gourdault-Montagne , Ambassador of France to China – have attended these four naming ceremonies in China. Philippe Louis-Dreyfus, President of LOUIS DREYFUS ARMATEURS Group declares about this partnership: ‘We are very pleased to be able to convince two major names such as FFP and Bank PBS to become our partners in the development of our shipping activities. It’s a natural token of trust regarding our 160 year-expertise but it is also an original decision from our two partners – particularly FFP – which have no shipping businesses until now’. Robert Peugeot, President and CEO of FFP adds: ‘We are pleased to be a partner of LOUIS DREYFUS ARMATEURS Group to start in the shipping sector. It is a very single opportunity to know and appreciate the shipping sector with a trustful partner who invites us to share its know-how’. LOUIS DREYFUS ARMATEURS Group (LDA), founded more than 160 years ago, is a French family-owned Group active in maritime transportation and services. Dry Bulk & Logistics: dry bulk transportation; industrial projects, offshore transhipment and port logistics for dry bulk. Industrial services: transportation of heavy and specialized cargoes with FRET-CETAM for AIRBUS; submarine cable installations with ALDA MARINE (partnership with ALCATEL-LUCENT SUBMARINE NETWORKS), ROV operations and services dedicated to marine renewable energies with LOUIS DREYFUS TRAVOCEAN; seismic research with GEOFIELD Ship Management services (partnership with CGG). FFP is an investment company listed on NYSE-Euronext Paris, majority-owned by Etablissements Peugeot Frères and managed by Robert Peugeot. FFP is one of the leading shareholders of Peugeot SA and pursues a minority shareholdings and long-term investment policy. FFP holds participations in listed companies (Zodiac Aerospace, DKSH, SEB or ORPEA), non-listed companies (Sanef or Onet), and private equity funds.